“The polio virus is very good at finding children and paralysing them. We must be better than the virus and find the children,” Sona Bari, the spokesperson for polio eradication at the World Health Organization (WHO), had once said. Polio, a potentially fatal infectious disease, has no cure but safe and effective vaccines are available. Nigeria recently reported two new cases among children in an area that had just been liberated from the Boko Haram militant group. The two other polio-endemic countries—Afghanistan and Pakistan—missed their 2015 eradication target and extended it to 2016. These are the only countries in the world that are yet to be polio-free. Internal conflicts make children inaccessible to aid workers. Besides, opposition from religious leaders and mistrust of national governments and global initiatives are primary causes of the prolonged struggle against polio. On October 16, 2016, the Afghan government in collaboration with the UNICEF and the WHO launched a national effort to vaccinate every child in Afghanistan under the age of five. The four-day campaign claims having immunised over 9.5 million children. De-worming tablets, which prevent worm infections that cause anaemia, malnourishment and mental and physical retardation in children, were provided. So far in 2016, eight polio cases have been reported in Afghan provinces: Kunar, Kandahar, Helmand and Paktika. In December 2015, polio vaccinations for thousands of Afghan children were delayed as health workers were unable to access remote regions controlled by the Islamic State group. A government official admitted that around 100,000 children could not get vaccinated in a four-day polio vaccination campaign in 14 eastern and southern provinces of Afghanistan due to the threat from militants. In order to stop this debilitating disease, the country has to find and vaccinate every child missed before. Observing the World Polio Day (October 24), the Baloch government organised a \campaign to vaccinate more than 1.6 million children under the age of five. About 6,040 teams were deployed across Balochistan to ensure that all children were inoculated. In a major behavioural change, religious scholars agreed to take part in the drive to persuade those refusing to take the vaccine. A similar anti-polio drive also kicked off in Karachi with a target of administering the polio vaccine to 2.2 million children. In 2016, Pakistan has seen 15 cases of polio so far, out of which five are from Sindh and only one from Balochistan. In contrast, there were over 300 cases of polio in Pakistan in 2014 and 54 in 2015, which shows about 70 per cent reduction this year. Nigeria is the only country in Africa that has reported cases of wild polio virus. Four cases have been reported from three districts in Nigeria this year so far. Reaching every child with a vaccine in a country that has weak health systems is quite a challenge. In the second week of October, the United Nations Children's Fund (UNICEF) launched an emergency anti-polio drive in 18 states in northern Nigeria along with the neighbouring Cameroon, Chad, Niger and Central African Republic to immunise over 41 million children. The campaign was the third of five vaccination drives to contain the wild strain of polio virus. Two more campaigns are scheduled to happen in November and December. After two years of being polio-free, three new cases of polio were detected in Borno state, two in August and another in September. Although the polio vaccine is easy to administer, large parts of Borno state have remained inaccessible to humanitarian agencies due to the Boko Haram insurgency. A large number of children have never been immunised against this diseases. 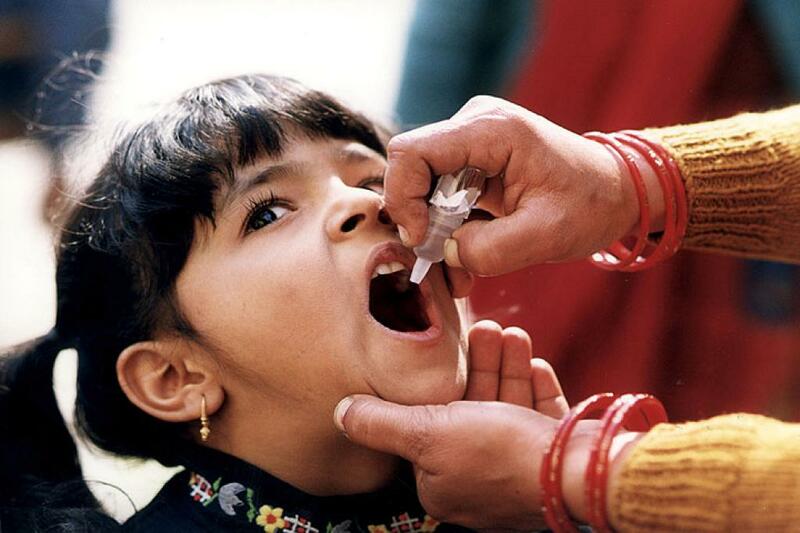 The WHO declared India polio-free in 2014. It has eradicated the wild polio virus and the last case was reported on January 13, 2011. In the last five years, no wild polio virus has been detected. However, the vaccine-derived polio virus, a rare strain of polio virus that has genetically mutated from the strain contained in the oral polio vaccine, has been reported 50 times in India in six years. No children were found to be affected by polio in areas where the virus has been found. According to the press release issued by the Healthy Ministry on June 15, 2016, detection of vaccine-derived polio virus does not change the polio-free status but “indicates robustness of surveillance system and willingness of the country to detect any kind of polio virus even from the environment (sewage)”. Polio, a contagious viral disease that affects the nervous system and causes irreversible paralysis, cannot be treated but can be prevented through vaccination. However, two companies—Sanofi Pasteur and Serum Institute of India Ltd—are not producing enough vaccines to meet the growing global need. According to WHO’s Strategic Advisory Group of Experts (SAGE), a severe shortage of inactivated vaccine will force countries to use a fractional dose through an intra-dermal instead of an intra-muscular injection. As the world is making a switch from the traditional “live” oral polio vaccine, which has higher chance of spreading the disease, to an inactivated vaccine that is injected, unavailability of such vaccines is a serious inconvenience. The two vaccine manufacturers are believed to have underestimated the challenges of scaling up their production. How effective is the global polio eradication drive?